Hello and welcome to GunShows-USA. We are the nations #1 Website for listing gun, knife, and survivalist (aka Prepper) shows. 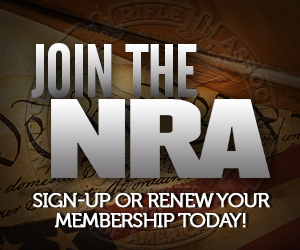 GunShows-USA is not a promoter, that is, the business of GunShows-USA is advertising. GunShows-USA does not “put on” shows, it advertises the shows being put on by promoters all across the U.S.A. Think of it as a sort of “Yellow Pages” in the phone book. The pages are filled with listings and advertisements. That is what GunShows-USA is. For table information, please contact the promoters in your area. All listings include each promoter’s contact information. We offer free listings and paid advertising for promoters to get the word out about their up-coming shows. We also offer advertising spaces for gun | knife | prepper related businesses, see our Descriptions & Pricing link under our “SUBMIT SHOW LISTINGS” in the main menu. 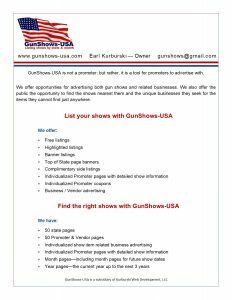 As a listing site, GunShows-USA promotes shows but is not a “promoter” and, therefore, does not rent tables. For venues and table prices, please contact the individual promoters in your area. You can find promoters on the Promoters & Vendors pages linked to each state. GunShows-USA has been around for more than 15 years and continues to grow in numbers (Yeah!). It is the first Website of its kind. Shows such as these were not getting the attraction they deserved. The need for advertising gun and knife shows to attract the attention of vendors everywhere was born when the retired vendor, Earl Kurburski, came up with the wonderful idea of creating a Website for listing gun and knife shows. Now, not only do promoters use the site to advertise; but also, vendors surf the site for finding venues, and the public and collectors utilize the site to find shows in their area. Great idea Earl! GunShows-USA is located in the state of ARKANSAS. We pride ourselves on our natural resources and beautiful land formations and scenery. Located just outside of Murfreesboro is the Crater of Diamonds State Park, which allows dedicated prospectors to search for precious gems including diamonds, amethyst, garnet, jasper, agate, and quartz. Arkansas is the place to visit during vacations and contains over 600,000 acres of lakes and 9,700 miles of streams and rivers. Visitors enjoy hunting, fishing, boating, camping, hiking, and yes, even gun shows in several of our cities. Check out our Arkansas page for show listings. Perhaps you will find a show or two in the area you want to visit. GunShows-USA is not a legal adviser and cannot give legal counsel concerning state gun laws and regulations.